The first spacecraft carrier design built by men of Earth was the STC-52/68 Shuttle-Transport/Space Fighter Carrier designed and built by Ceres Industrial during the Great War period of the 2050s and 2060s. It was a completely enclosed spacecraft carrier that did not make use of a "flattop" type take-off and landing "runway" (normally found on ocean warships) due to friction concerns related to the nature of space-based operations. Instead, the STC-52/68 used vertical launch cages to "boost" its sixty SF-01 space fighters out of the six concealed hangar bays like missiles from a silo. Each bay had a large door (identified by the red triangle on it) that swung open in the manner of a multi-shot missile launcher, each able to "fire" up to ten SF-01 space fighters at a time. While not a problem in outer space, on a planet, the STC-52/68 was all but useless. The drag on its fighter hangar doors made the ship so unstable that it was extremely dangerous to attempt any kind of launching of space fighters, even in the thin atmosphere of Mars: on Earth and Venus it was impossible. Therefore, the pure space fighter carrier concept was abandoned after 2070 and the outbreak of the 1st Interplanetary War due to the need for a transatmospheric aerospace carrier platform. With the outbreak of the 1st Interplanetary War, the Solar Empire became hard pressed to field warships capable of bringing the war to the doorstep of the EFR. The decision was made early on to include a spacecraft carrier vessel among the new designs of vessels that would make up the ranks of the Ironclad fleets. Since the primary short-term goal of the Solar Empire forces was to repel both the encroaching EFSN forces and the Zhukovist rebels in space, the Solar Empire once again focused on a purely spacefighter carrier with limited--albeit superior--atmospheric take-off-and-landing capabilities. The Chimer class did not incorporate a flattop style "runway" deck on the dorsal side of the spacecraft carrier vessel. Instead, the Chimera used four elevator doors that rose up to corresponding electromagnetic launch "catapults" which shot space fighter craft off the ship rapidly. This rapid launch system was very successful and allowed the Chimera to deploy its complement of fighter craft very quickly. Retrieval of the fighters was done on the ventral side of the carrier where hangar doors within the wide, upside down "U" shaped hull of the ship. This retrievable system was very effective in space, but proved problematic in Earth's atmosphere and thus the Chimera was ill suited to the task of a transatmospheric spacecraft carrier. No UN built craft met the challenge of aerospace combat. It was the Earth Federal Forces who pioneered the spacecraft carrier designs of future Earth built spacecraft carriers. The Ceres Regency did not put any stock into the value of space fighters, their battle doctrine centered around the Prodono battlesuit type of mecha commonly found within the derelict fleet of alien warships that were around Alpha Centauri. In short, the Ceres designs incorporated a basic hangar deck, with a "guide-runway" used simply to help pilots navigate their way to the landing area on the top of their large-scale capitol ships. However, these guide-ways did not have catapults or "null-field" friction compensators for use with spacefighters. Instead, their space fighters used the natural VTOL capability in space to take off and land directly into and out of the hangar bay on the dorsal side of most of their craft. 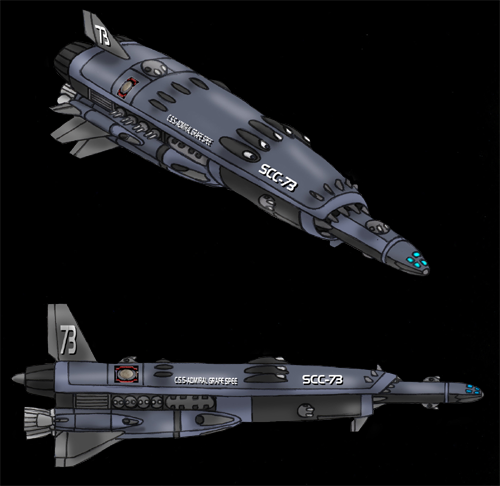 A prime example of the dorsal hangar and "guide-way" arrows can be seen on the Sharnhorst class of main space battleship. The Richtoven class used a top mounted hangar door that allowed its complement of 20 mecha (Weirmechs) to launch and return in the conventional spacecraft manner. 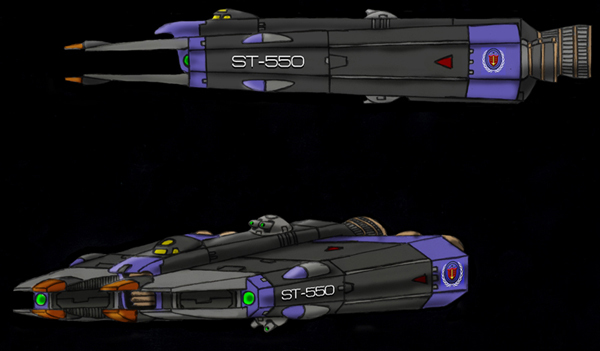 Designed during the 2060s, the Richtoven class was conceived of during a time when the ST-52/68 was still the premier spacecraft carrier vessel within the Sol system. While effective for most operations, the Richtoven class' hangar bay design was useless in an atmosphere, and frankly quite dangerous within a gravity well due to the small size of the hangar bay door and its location on the dorsal side of the warship. A second approach the Ceres Regency took was to copy the United States Space Navy and Earth Federal Republic concepts of the port and starboard hangar bays providing a hangar deck on each side of the ship. The Admiral Graf-Spee incorporated this concept in its design. This allowed the Kosmo Walkurie space fighters to take and land as needed from each of the two hangars. However, this pair of hangar bays suffered from the same deficiencies in an atmosphere as those found on the USSN/EFSN type warships. The original Earth Federal SpaceNavy forces were based on USSN designs and were thus intended primarily for space warfare. Therefore, the first "carrier" used by the EFSN was the Anapolis class cruiser. This cruiser used an ingenious airlock system that allowed for a modestly rapid deployment of its HSF-01 complement of space fighters. However, in an atmosphere, this airlock system was all but useless making retrieval of HSF-01 space fighters slow and very difficult. It also presented a tempting target for aerospace fighters to land a missile or two into the unprotected interior of the hangar whose bow bulkhead abutted the main reactor chamber of the Anapolis type warships. While this was fine for the Space Navy, whose vessels rarely entered into an atmosphere, the Earth Federal Space Marines required ships capable of transatmospheric ability. This requirement from the EFSM meant that the new class of planetary assault ships would have to incorporate a "frictionless" system for space operations and a flattop design for atmospheric missions. Thus the 1/2-top design was born. The first class of vessel to use the 1/2-top was the Nevada class Light Assault ship, followed by the Alaska class and Warspite class. These three classes of ships proved the effectiveness of the 1/2-top design in the battles of Venus, Mars, and anti-piracy operations of the post-1st Interplanetary War years. The operational concept behind the 1/2-top was to allow space battle robots to launch from the elevators of the planetary assault ship directly, without the use of the electromagnetic catapults, while also allowing space fighters and Protean fighters to take advantage of the flattop portion of the ship via the catapults. 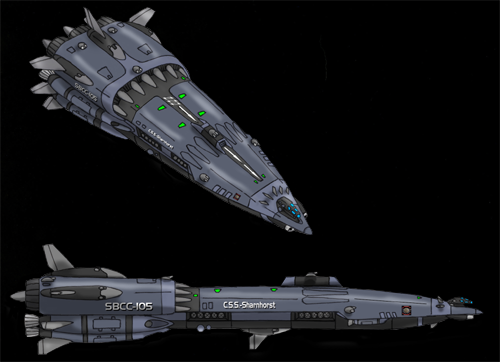 This combination of both atmospheric and space capabilities made the EFSM vessels very versatile and unmatched compared to their contemporaries. 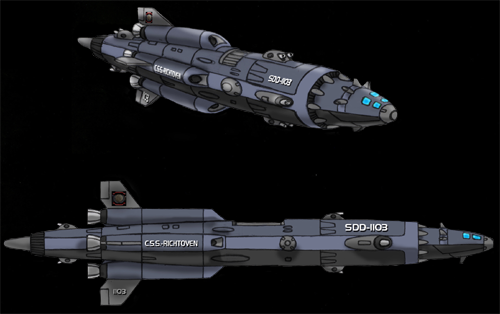 The final major spacecraft carrier design was also built by the EFSM, albeit after they had become the Jovian Defense Forces. This final design was a full fledged flattop space carrier vessel capable of space, aerial, and oceanic operations. When the last phases of the 1st Interplanetary War began, it quickly became obvious to the EFSM that "full-system" warfare required a carrier vessel of operating in any environment and for any period of time as required by the parameters of the operation. 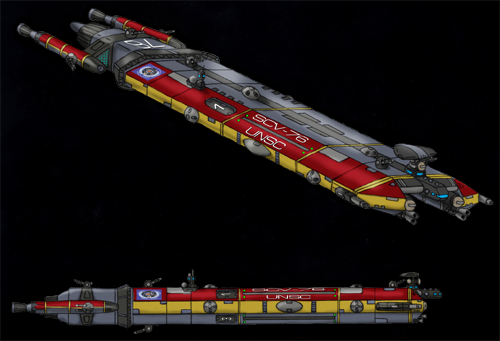 Thus the Jovian Defense Forces, in cooperation with the United Solar Republic, developed a spacecraft carrier design that was reminiscent of the old ocean-based carrier vessels on Earth. This new class was dubbed the Lord Nelson Class. One of the unique features of the Lord Nelson class was the "null-field" generated over the "tarmac" of the flattop on the dorsal side of the carrier. This null-field reduced the friction of the surface of the "runway" of the vessel thus improving space based operations. Five electromagnetic catapults provided unprecedented deployment ability in record time for a space carrier of the 1st Interplanetary War time frame. 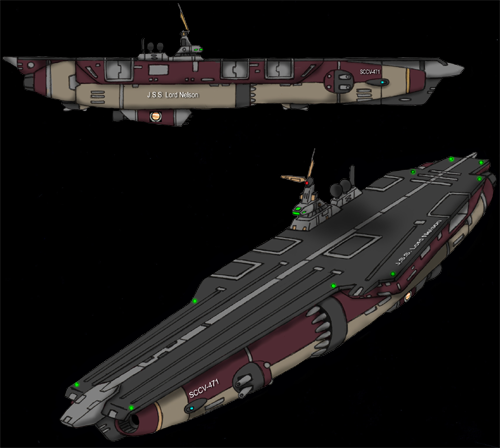 This deployment capability assisted the JDF during the final battle of the war near Jupiter's moon Io, and proved the effectiveness of a large-scale oceanic style carrier for both space and planetary operations. From the Lord Nelson came a very long line of human built spacecraft carriers--aesthetically similar to their planet bound cousins--that would serve throughout the 21st and early 22nd centuries. Overall, the spacecraft carrier designs of the 2050s through 2070s inspired a whole fleet of new carrier craft that helped shape the future of space warfare between the powers of Earth for many decades. However, as humanity expanded into the galaxy it quickly found that these basic design concepts were useful only for colonial and orbital guard fleets. While all three approaches to the spacecraft carrier concept certainly had merit, the 1/2-top actually proved to be the most successful innovation due to the versatility is provided spacecraft for nearly any type of operation a carrier or planetary assault ship was likely to encounter.